When your commercial property is affected by water damage, it affects your entire business. If the water has damaged essential equipment, inventory, or documents, or if the structure has been significantly impacted, your business may have to shut down temporarily, hurting both your business and your employees. 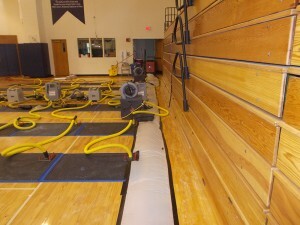 At WET, we take immediate action to protect your business and your commercial property from water damage. Our experienced team is available 24/7 to respond to your water emergency, and will work quickly to contain the water, assess the damage, and develop a plan for extraction and drying that won’t interfere with your business. Our goal is to mitigate the damage, both to your property and your business. In addition to dealing with the physical damage to your property, WET also provides contents cleaning services and will securely pack up and transport your items to our contents cleaning facility. Our team can clean and restore electronics, documents, specialized equipment, artwork, and more. You can rest assured that your items will be handled with care, and once they have been restored and your commercial property has been restored, our team will transport them back to your property and put everything back where it belongs. The entire process is documented from start to finish. We are locally owned and operated, and as a local business we understand how important it is to mitigate the effects of water damage on your business. We are available to respond to your water damage emergency 24/7, and will deliver results quickly but without compromising service or quality.